I thought I would pop in and share my work table. You know how over the summer I dyed vintage textiles? Suzy of Suziqu's Threadworks, Nancy of Sugar Lump Studios. 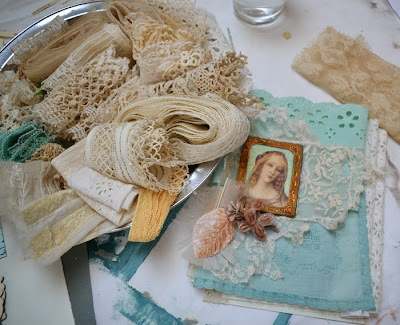 They inspired me to begin my own vintage lace collage book. 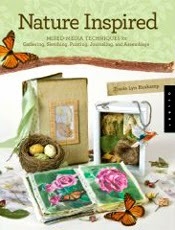 Traci Lyn Huskamp of Red Door Studios wrote this book. I can say she is a joyful soul! and my dreams of vintage lace books. 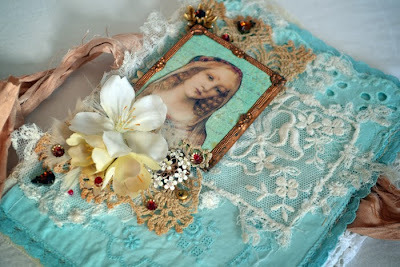 you can visit her blog Red Door Studios and see. I love how she paints birds. and I believe she has a calendar out this year. I still have to stop myself from cringing when I cut into vintage textiles...do you? before I came to a final composition for the cover. but maybe saved creating it for last, as it is bulky. This is where I am so far with the cover. I am still musing over it while I begin to lay out the interior. ooo Terri, this is going to be something wonderful! I'm loving the colour you dyed your lace! Such a pretty blue. 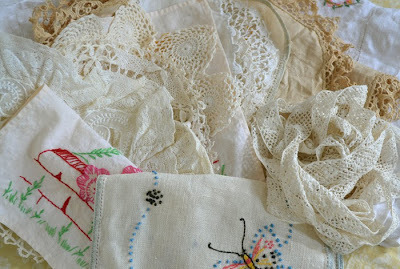 Cutting into vintage linens used to scare me but after I did it a few times I lost the fear and came to the decision that actually USING them is far better than having them stored in a drawer somewhere. Putzing is good.......your book is coming along nicely! I have one of Tracy's calendars for 2013 and am going to order next years soon. They are stunning! I'll be checking in to see your progress on your journal. It's SO you! That is really coming together beautifully! Vintage incredible! It already looks gorgeous, Terri. Swoon. Have a lovely Sunday. So gorgeous!! 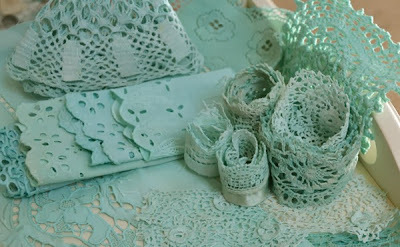 LOVING all that lace!!!! It looks lovely and so delicate. vous nous le montrerais une fois fini ???? All beautiful! I too am enjoying making vintage fabric collages. Thank you for sharing that wonderful book! Because of your post, I just bought it on my Kindle. I'm looking forward to reading it and of course, I'm very excited in seeing your finished beautiful collage book. I so recogize that feeling of not wanting to cut into such treasures but when you're making something so beautiful it's definitely worth it. Can't wait to see how this lovely project will develop! 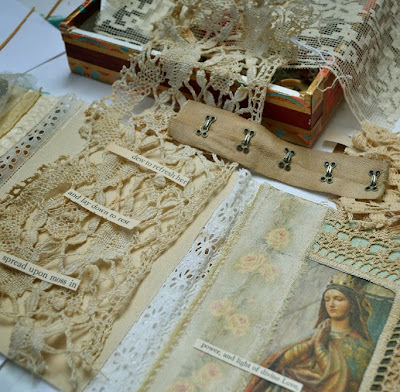 Dear Terri,-ohhhh it is so amazingly beautiful, I LOVE what you already did, and what you started on... those pages are SOOO beautiful, and all the laces and old bits ,will be a most wonderful part of it. I really can`t wait to see it finished . The book I already have, found it once on Amazon, and bought it right away,-it is still a favorite of mine. Hope you are all well, dear friend. 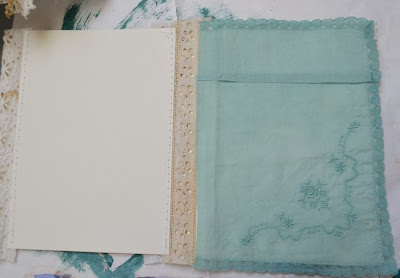 I've been planning to make a lace book. They are so beautiful. Yours is going to be gorgeous. This is going to be a beautiful book, and I look forward to seeing the finished piece! I have that same book of Traci's and am so inspired by her work. I didn't know about the calendars, but will be looking for one today! I remember the seafoam green! It's so perfect for your book. Can't wait to see the rest of the process. Your book is going to be beautiful. 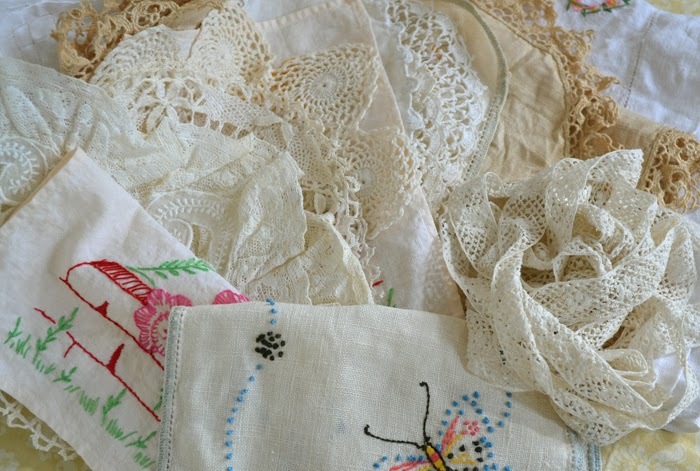 But as a collector of antique linens the thought of someone cutting them up to make a project makes me ill. But that is my personal thought as I fell the more of these treasures that are cut up on glued onto paper, the less antiques there will be in the years to come for other to cherish. 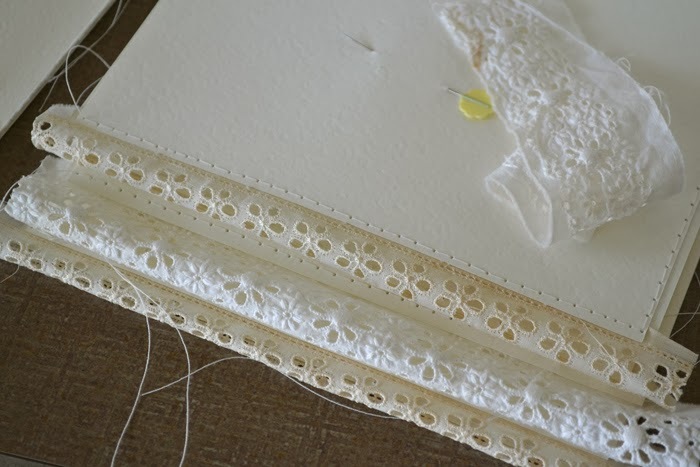 Now if the piece of linen is so damaged or is just bits and pieces left over from the creation of something from years ago, that it can't be used, I have no issue with that. Can't wait to see the finished project and I love the theme. Wow..so beautiful..and I love "renew" a very powerful word and such meaning on so many levels!! I am so enchanted by all of your creations...so beautiful! The piece you are working on gave me deja vu in a beautiful spiritual way..it made me think of something special in Italy as a little girl..the color is awesome, the whole piece is stunning and inspiring!